Own Your Own Castle on the Beach! Beachfront home in La Hacienda , partially furnished. 3-Story living with Stunning Water views and roof top deck with 360 views, 2 car garage. Home with flexible floor plan. Also a rentable apartment with private entry and on the beach. La Hacienda is a Beach front gated Community with a Security gate and the Best Sea Views and Bricked Streets. .SOLD! You missed this one. Don't miss the next HOT ONE! Access to the white sandy beach and Blue sea water. Great sea views from the Lot, front and back. 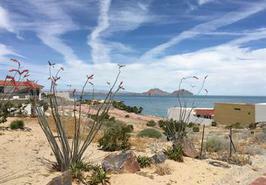 The La Hacienda Community at Km 1 in San Felipe is very popular with red brick streets and stunning views. Build now or wait; the electric is ready for meter and water is included with the HOA. 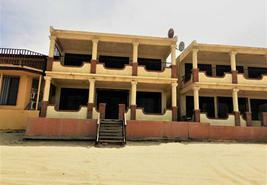 Two Furnished Condos, one upstairs and one downstairs in one beach front property. Each condo has a Fireplace in the Great room with Spectacular views. Condos have their own Electric meter and carport for each. 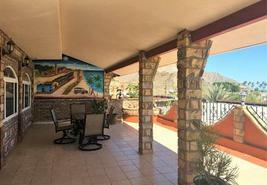 Condos have their own Private access to the white sandy beach on the of the Sea of Cortez. 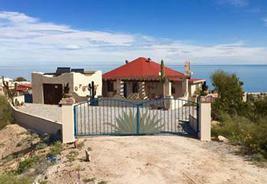 The property is titled as one Property with one Tax ID number in a Mexican title. Remodeled and updated in the past 2 years and a freshly painted exterior. Gorgeous kitchen with cobalt blue tile counters and high end stainless steel appliances, custom cabinetry with multiple slide-outs, a pantry, & a slide-out spice rack. The main living space is very open with beautiful fireplace for romantic ambiance and loft for potential artist space or extra sleeping quarters. The dining area overlooks the Sea is situated right off of the kitchen. A spacious Bathroom features a grand walk in shower, hand painted sink and a unique window design that brings dancing sunlight into the room. Detached garage houses solar equipment and enough room to store your beach toys or buggy. Great views and gated privacy fence. Too much to list! Fun and inviting Sea View Villa. Beautifully furnished home with mini splits in each room. The Large main patio is great for entertaining and just relaxing with the Sea View. A water filtration and purifying system is throughout and all appliances and a washer & dryer are included. Two murals painted by Artist Ruben Gomes and Alarm system, extra storage and Laundry room. 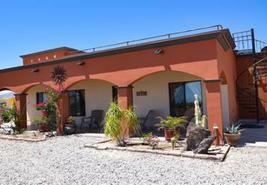 Owner has obtained a Mexican Corporation that can be sold with the home and keep closing cost at a minimum.